Shield your iPhone 5/5s/5c with this high-quality, full screen, protector that keeps your phone looking brand-new. Enjoy peace of mind and consider accidental drops, scratches, fingerprint smudges and smashed screens a thing of the past. Save yourself from the headache of repairing or replacing your smartphone with this extremely easy to apply protector. Some protectors distort the color or picture of your phone’s screen, which is less than desirable. 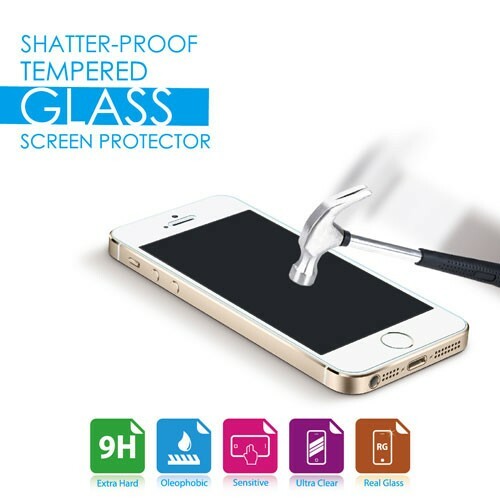 This protector guarantees that you get the crystal-clear screen quality you know and love and maintains precise touch screen accuracy with the same real glass feel. Along with protection from scratches and cracks, the extra level of screen protection also covers you against unsightly fingerprints and dirty smudges on your iPhone. Whether you're upgrading your phone or just borrowing one for a few days, your screen protection can come with you. Conveniently peel it off your screen and transfer it to another iPhone 5, 5s or 5c, and there won't be any cracking, bubbling or sticky residue left behind..